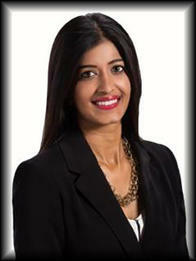 Swathi is a vice president and business banking relationship manager at Fifth Third Bank in South Florida. She works directly with business owners, controllers, and CFO’s in Broward and Miami-Dade counties to develop a financial plan to drive business growth. Working primarily with mid to large-sized companies, Swathi’s focus areas are in the manufacturing, trade, and healthcare industries. Swathi was raised in Northeast Pennsylvania and relocated to South Florida in 2007 after graduating from Fordham University in New York City. She currently lives in Ft. Lauderdale with her husband and three children and enjoys traveling, cooking, and spending time outdoors with her family. Swathi graduated from Leadership Ft. Lauderdale (Class of XXI) and stays active in their organization in order to give back to her community. She is also a member of Greater Ft. Lauderdale Chamber of Commerce and supports several area non-profits such as Feeding South Florida, United Way of Broward County, and American Cancer Society.